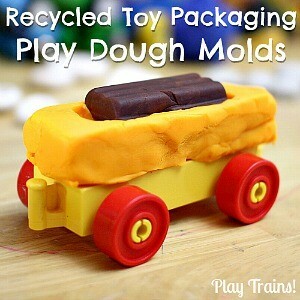 This is a great way to combine old favorite toys with awesome new toys as kids grow. 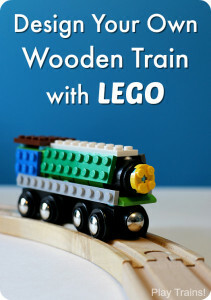 While LEGO DUPLO figures are a little big to go with wooden trains, LEGO minifigures are a very compatible size. 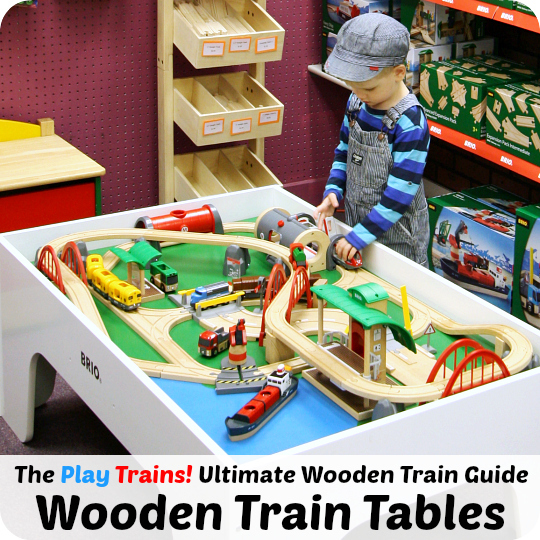 They fit in the wooden train freight cars — but, more often than not, they fall out as the trains chug around the tracks. Here are a couple of simple tricks to give some lucky LEGO minifigures the chance to ride — and even drive! 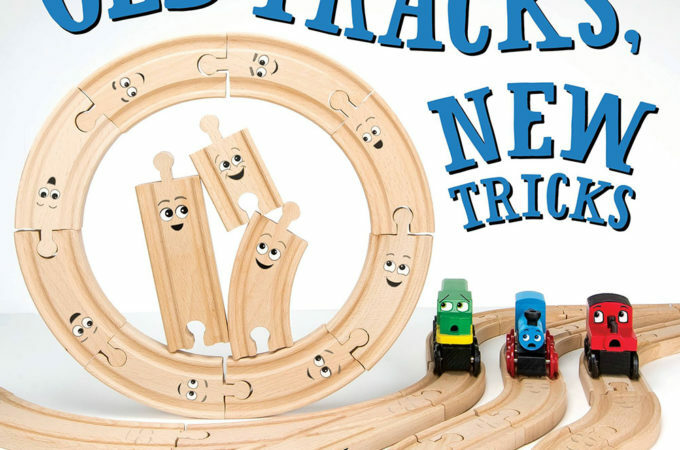 — your child’s wooden trains without falling out of them. 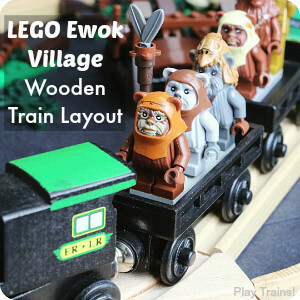 First, I’ll show you how to keep minifigures in wooden train freight cars, and then I’ll demonstrate how to give them a place to stand so they can drive wooden engines. 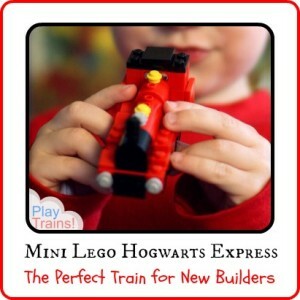 LEGO minifigures — especially ones with the normal minifigure legs that allow them to sit — can ride well enough in wooden train freight cars with higher sides. But they tend to fly out of the low-sided freight cars every time the train hits a curve, no matter how carefully we drive our trains. 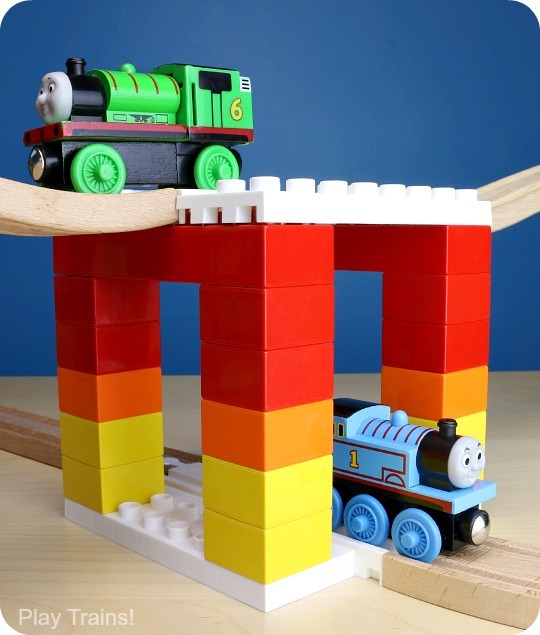 The easiest solution is to use a flat 2 x 6 stud LEGO brick in the bottom of the freight car. Just attaching the minifigs to that will make them fall out less often, especially if you line up two or three of them on the LEGO in the bottom of the car to weigh it down a bit more. 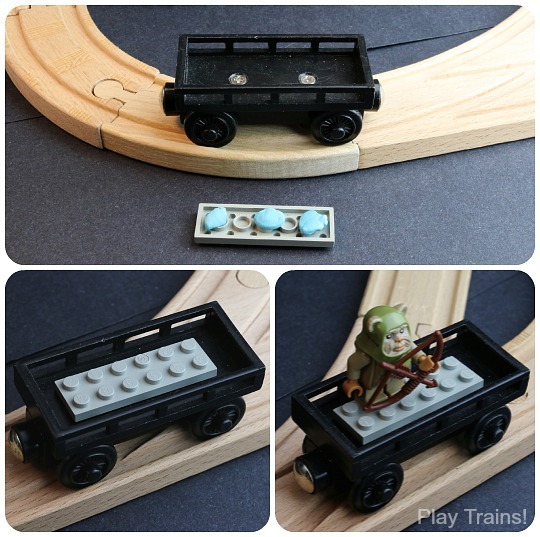 Now you can easily attach and detach the minifigures to the freight car, again and again. 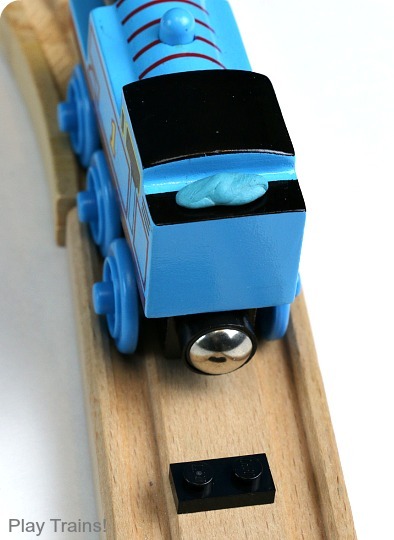 And — in our experience — the poster putty doesn’t damage the trains at all, so you don’t have to worry about your modifications becoming permanent. 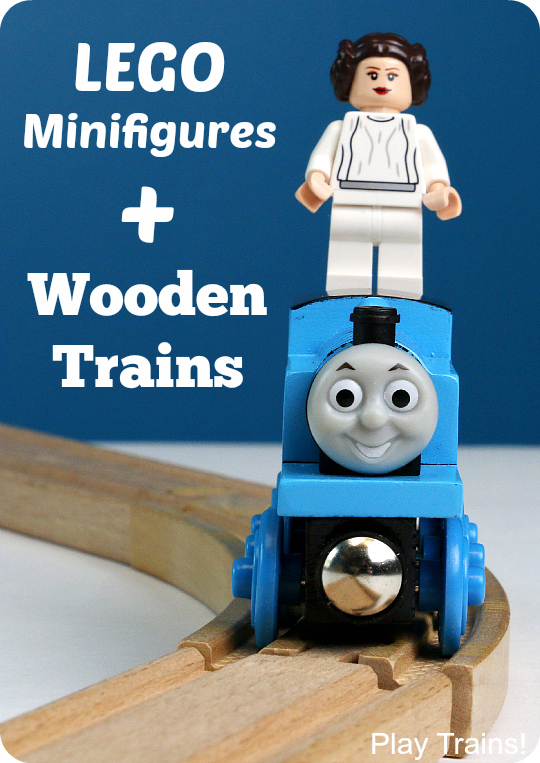 You can also have a minifigure drive a wooden train engine. 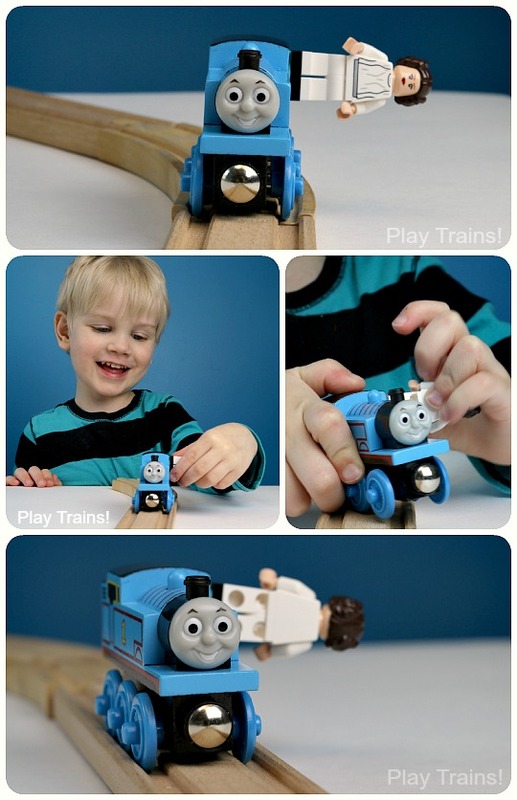 This works especially well with Thomas and his fellow tank engines. Their coal bunkers are the perfect place to put the LEGO for attaching the minifigure. 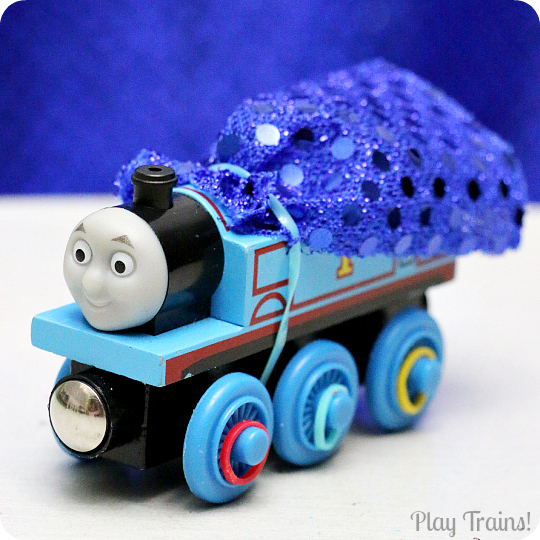 First put a small lump of the poster putty on top of where Thomas’ coal would be. 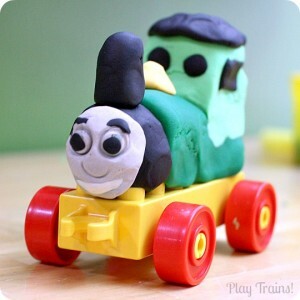 Then press a flat 2 x 1 LEGO brick on top of it — preferably black, so you can pretend it’s coal. (I used a bit more poster putty than I had to in this picture. But if you use less, so that it doesn’t stick out from under the LEGO, it looks a lot more like coal.) 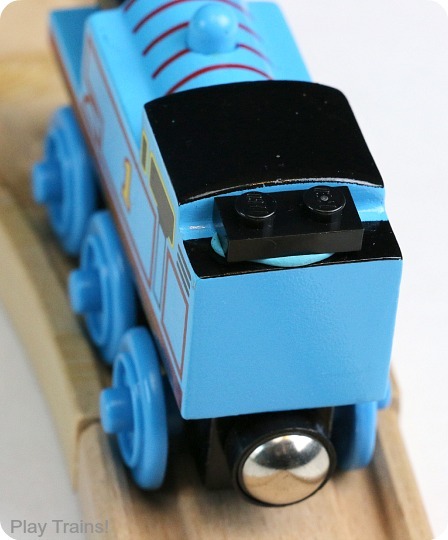 Now a minifigure can drive Thomas all around the wooden tracks. As you can see, the Little Engineer thought that was hilarious, and immediately set out to make it “even funnier!! !” by turning Princess Leia sideways and backwards. wow!! I wish I’d found your website years ago, but now I know what I’ll be spending tommorow doing! !